With a hectic weekend at the Fringe planned, we couldn't quite summon up the enthusiasm for an additional Friday night run through to Edinburgh. So the less taxing option of seeing the Scottish Youth Theatre's "Hero" in Glasgow proved attractive. 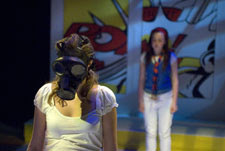 Devised by the cast, it is three intercut tales based loosely on the theme of heroes . In the first of these we follow Stephanie and Jess as we are reminded how cruel children can be and and how attractive it can be to retreat to a world of comic books. It's well structured and performed and at times really quite thrilling. The second element is the one with most to say for itself as we follow the celebrity obsessed Sophie as she aims to make the pages of the glossy magazines she reads religiously. Sharply written, it gives some insight into how damaging such a pursuit can be. The 'self help' segment was a personal highlight - marvelously funny while remaining all too close to the truth. Dance and movement have clearly been a large part of this year's festival and are used to great effect here. The last segment featuring an ongoing battle between 'Red' and 'Blue' had some very nice moments but isn't as fully realised as the other two. Despite being well performed I'm left unsure as to quite what I was supposed to take from it. It also suffered from including a consideration of the power of masks that was considerably overlong. In addition to the three tales we have a compelling performance from our narrator who gives us a historical context to our need for heroes - frequently delivered while playing the piano. Despite a moment or two which felt 'by-the-numbers' the SYT have once again produced an entertaining evening of which all involved can be proud. "Hero" has now completed its run at the Brian Cox Studio in the SYT building.